We showed in a previous publication that there are six independent dimension-seven operators violating both lepton and baryon numbers (L = −B = 1) and twelve ones violating lepton but preserving baryon number (L = 2, B = 0) in standard model effective field theory, and we calculated one-loop renormalization for the former six operators. In this work we continue our efforts on renormalization of the operators. It turns out this could become subtle because the operators are connected by nontrivial relations when fermion flavors are counted. This kind of relations does not appear in lower dimensional operators. We show how we can extract anomalous dimension matrix for a flavor-specified basis of operators from counterterms computed for the above flavor-blind operators without introducing singular inverse Yukawa coupling matrices. As a phenomenological application, we investigate renormalization group effects on nuclear neutrinoless double β decay. We also discuss very briefly its analog in the meson sector, K± → π∓μ±μ±, and indicate potential difficulties to compute its decay width. W. Buchmüller and D. Wyler, Effective Lagrangian analysis of new interactions and flavor conservation, Nucl. Phys. B 268 (1986) 621 [INSPIRE]. L. Lehman, Extending the Standard Model effective field theory with the complete set of dimension-7 operators, Phys. Rev. D 90 (2014) 125023 [arXiv:1410.4193] [INSPIRE]. L. Lehman and A. Martin, Hilbert series for constructing Lagrangians: expanding the phenomenologist’s toolbox, Phys. Rev. D 91 (2015) 105014 [arXiv:1503.07537] [INSPIRE]. B. Henning, X. Lu, T. Melia and H. Murayama, 2, 84, 30, 993, 560, 15456, 11962, 261485,. . . : higher dimension operators in the SM EFT, JHEP 08 (2017) 016 [arXiv:1512.03433] [INSPIRE]. A. Aparici, K. Kim, A. Santamaria and J. Wudka, Right-handed neutrino magnetic moments, Phys. Rev. D 80 (2009) 013010 [arXiv:0904.3244] [INSPIRE]. F. del Aguila, S. Bar-Shalom, A. Soni and J. Wudka, Heavy Majorana neutrinos in the effective Lagrangian description: application to hadron colliders, Phys. Lett. B 670 (2009) 399 [arXiv:0806.0876] [INSPIRE]. S. Bhattacharya and J. Wudka, Dimension-seven operators in the Standard Model with right handed neutrinos, Phys. Rev. D 94 (2016) 055022 [Erratum ibid. D 95 (2017) 039904] [arXiv:1505.05264] [INSPIRE]. Y. Liao and X.-D. Ma, Operators up to dimension seven in Standard Model effective field theory extended with sterile neutrinos, Phys. Rev. D 96 (2017) 015012 [arXiv:1612.04527] [INSPIRE]. S. Antusch, M. Drees, J. Kersten, M. Lindner and M. Ratz, Neutrino mass operator renormalization revisited, Phys. Lett. B 519 (2001) 238 [hep-ph/0108005] [INSPIRE]. C. Grojean, E.E. Jenkins, A.V. Manohar and M. Trott, Renormalization group scaling of Higgs operators and Γ(h → γγ), JHEP 04 (2013) 016 [arXiv:1301.2588] [INSPIRE]. J. Elias-Miró, J.R. Espinosa, E. Masso and A. Pomarol, Renormalization of dimension-six operators relevant for the Higgs decays h → γγ, γZ, JHEP 08 (2013) 033 [arXiv:1302.5661] [INSPIRE]. J. Elias-Miro, J.R. Espinosa, E. Masso and A. Pomarol, Higgs windows to new physics through d = 6 operators: constraints and one-loop anomalous dimensions, JHEP 11 (2013) 066 [arXiv:1308.1879] [INSPIRE]. E.E. Jenkins, A.V. Manohar and M. Trott, Renormalization group evolution of the Standard Model dimension six operators I: formalism and λ dependence, JHEP 10 (2013) 087 [arXiv:1308.2627] [INSPIRE]. R. Alonso, H.-M. Chang, E.E. Jenkins, A.V. Manohar and B. Shotwell, Renormalization group evolution of dimension-six baryon number violating operators, Phys. Lett. B 734 (2014) 302 [arXiv:1405.0486] [INSPIRE]. R. Alonso, E.E. Jenkins and A.V. Manohar, Holomorphy without supersymmetry in the Standard Model effective field theory, Phys. Lett. B 739 (2014) 95 [arXiv:1409.0868] [INSPIRE]. C. Cheung and C.-H. Shen, Nonrenormalization theorems without supersymmetry, Phys. Rev. Lett. 115 (2015) 071601 [arXiv:1505.01844] [INSPIRE]. E.E. Jenkins, A.V. Manohar and M. Trott, Naive dimensional analysis counting of gauge theory amplitudes and anomalous dimensions, Phys. Lett. B 726 (2013) 697 [arXiv:1309.0819] [INSPIRE]. Y. Liao and X.-D. Ma, Perturbative power counting, lowest-index operators and their renormalization in Standard Model effective field theory, Commun. Theor. Phys. 69 (2018) 285 [arXiv:1701.08019] [INSPIRE]. C. Arzt, Reduced effective Lagrangians, Phys. Lett. B 342 (1995) 189 [hep-ph/9304230] [INSPIRE]. NA48/2 collaboration, Searches for lepton number violation and resonances in K ± → πμμ decays, Phys. Lett. B 769 (2017) 67 [arXiv:1612.04723] [INSPIRE]. W. Rodejohann, Neutrino-less double beta decay and particle physics, Int. J. Mod. Phys. E 20 (2011) 1833 [arXiv:1106.1334] [INSPIRE]. KamLAND-Zen collaboration, Search for Majorana neutrinos near the inverted mass hierarchy region with KamLAND-Zen, Phys. Rev. Lett. 117 (2016) 082503 [Addendum ibid. 117 (2016) 109903] [arXiv:1605.02889] [INSPIRE]. GERDA collaboration, Improved limit on neutrinoless double-β decay of 76 Ge from GERDA phase II, Phys. Rev. Lett. 120 (2018) 132503 [arXiv:1803.11100] [INSPIRE]. nEXO collaboration, nEXO pre-conceptual design report, arXiv:1805.11142 [INSPIRE]. H. Pas, M. Hirsch, H.V. Klapdor-Kleingrothaus and S.G. Kovalenko, A superformula for neutrinoless double beta decay. 2. The short range part, Phys. Lett. B 498 (2001) 35 [hep-ph/0008182] [INSPIRE]. F.F. 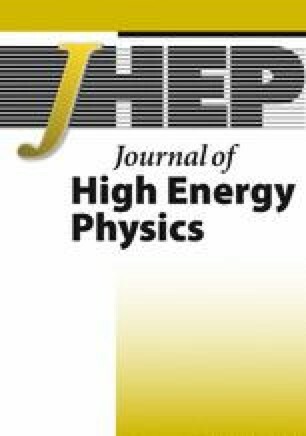 Deppisch, M. Hirsch and H. Pas, Neutrinoless double beta decay and physics beyond the Standard Model, J. Phys. G 39 (2012) 124007 [arXiv:1208.0727] [INSPIRE]. M. Horoi and A. Neacsu, Towards an effective field theory approach to the neutrinoless double-beta decay, arXiv:1706.05391 [INSPIRE]. Particle Data Group collaboration, Review of particle physics, Phys. Rev. D 98 (2018) 030001 [INSPIRE]. L.N. Mihaila, J. Salomon and M. Steinhauser, Renormalization constants and β-functions for the gauge couplings of the Standard Model to three-loop order, Phys. Rev. D 86 (2012) 096008 [arXiv:1208.3357] [INSPIRE]. X. Feng, L.-C. Jin, X.-Y. Tuo and S.-C. Xia, Light-neutrino exchange and long-distance contributions to 0ν2β decays: an exploratory study on ππ → ee, Phys. Rev. Lett. 122 (2019) 022001 [arXiv:1809.10511] [INSPIRE].